The Hungarian armed forces (known as the Honvedseg) were built up from the 1920s, their expansion gaining momentum once Hungary became free of the strict post-First World War Trianon treaty limitations in August 1938. Politically, Hungary was looking for a strong ally, who would help it to recover at least some of the territories containing sizeable Magyar ethnic populations that had been lost after the First World War. Initially, in the mid-1930s, Italy gave political assistance and supplied military materiel; then - on the eve of the Second World War - Germany also lent some support. In November 1938, Hungary managed to peacefully recover a chunk of its former territory from Czechoslovakia, followed by the Sub-Carpathian area during a brief border war in March 1939, and then the northern part of Transylvania from Rumania in August 1940. Later, in April 1941, the Bachka region and parts of Baranya were also taken back from the dismembered Yugoslavia, in a swift military action. The rub is that Hungary was sucked into the cauldron of the Eastern Front, and soon the Honveds (Hungarian soldiers) found themselves deep in Soviet territory, outgunned and outnumbered by the Red Army. Later on, from August 1944, the beleaguered Honvedseg had to fight in defence of its own territory. Alongside tiny Croatia, Hungary remained the last German ally up to the bitter end, and paid the price accordingly. 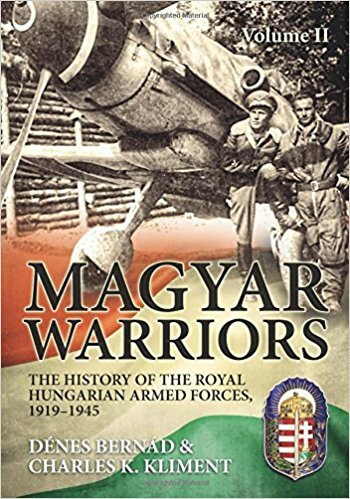 This comprehensive reference, to be published in three volumes - the fruit of over twenty years of meticulous research - strives to provide a complete picture of the Hungarian armed forces between the years 1919 and 1945. Volume 1 (published in 2015) presents a brief history of the Magyars up until the end of the Second World War, as well as the building of the armed forces, and details the armoured formations and their equipment. Volume 2 covers in great details the activity of the air force (Chapter 4), the river flotilla (Chapter 5), as well as the combat operations of the Honvedseg (Chapter 6). The final volume will contain type sheets of every weapon and vehicle used by the Army, as well as all aircraft types in service with the Air Force. The discussed topics are described in great details, and illustrated with over 500 photographs, several maps and many tables.